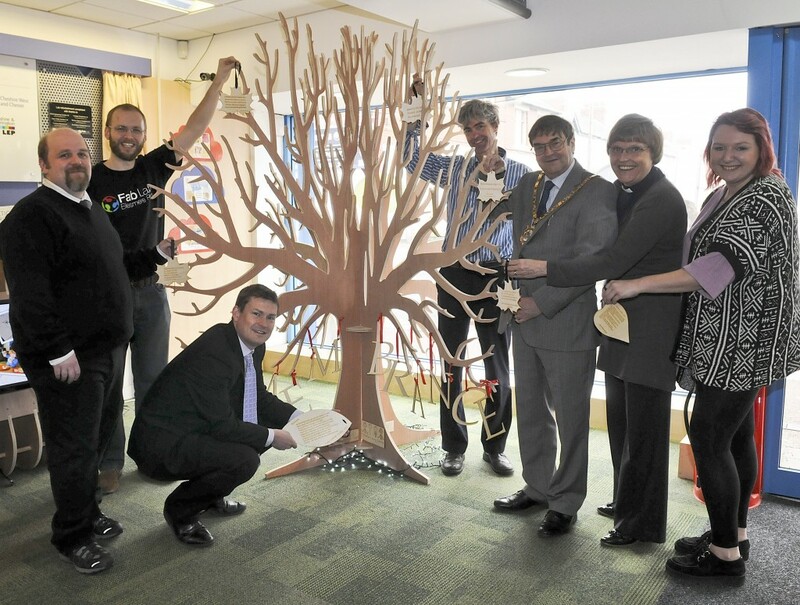 1 April 2014 – A Peace and Remembrance Tree designed and built by Cheshire’s Young Carers at the town’s FabLab has been officially unveiled by the Mayor of Ellesmere Port, Councillor Bob Crompton. Made out of plywood and standing at ten feet tall, the tree is the outcome of collaboration between FabLab and the Cheshire Young Carers, who together have designed and manufactured it using specialist equipment including laser cutters over the past few months. The project has been designed as part of the town’s commemoration of 100 years since World War One as part of the Ellesmere Port Arts Festival 2014. Members of the public now have the opportunity to add their own peace and remembrance messages onto the tree, until the end of the Ellesmere Port Arts Festival, when the tree will be in full blossom. Mayor of Ellesmere Port, Councillor Bob Crompton, who placed his own bespoke message about peace and remembrance as the first wooden leaf on the tree, said: “Ellesmere Port is really coming alive with culture, art and history throughout our first ever arts festival and the hard work and messages that young people have shared through this project have been incredible. FabLab Manager, David Armson, said: “It was a privilege for Fab Lab to be involved in such a brilliant project. The project was made possible by local ward Councillors from Ellesmere Port, who made contributions from their budgets to support the Ellesmere Port Arts Festival 2014 fringe programme of events. The Arts Festival is part of an increasing cultural program of events in the town as envisaged by the Ellesmere Port Development Board in their Vision and Strategic Regeneration Framework. Local Councillor, Justin Madders, said: “It was truly inspiring to see the thoughts of the young carers imprinted on the leaves. For more information on Ellesmere Port’s Arts Festival 2014 please visit the portarts festival or email Jochem.hollestelle@cheshirewestandchester.gov.uk.